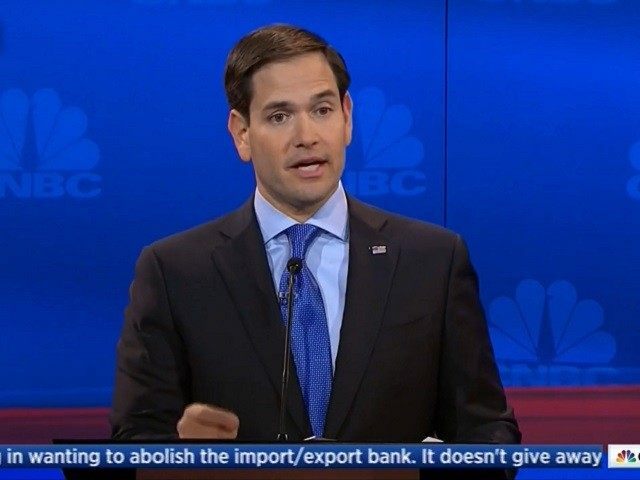 In a Thursday morning radio interview, Rubio amped up the defensive claims he made at Wednesday night’s CNBC debate. Rubio said that he “proposed… reforms” that would prevent wealthy corporations from using foreign professionals as low-cost alternatives to experienced American professionals. At Wednesday night’s GOP debate, Rubio was asked about his co-authorship of controversial legislation–- known as the I-Squared bill — that would triple the number of wage-depressing H-1B visas up to 195,000 per year. In Rubio’s home state of Florida, the Walt Disney Company used H-1Bs to lay off hundreds of American workers and force them to train their foreign replacements. Disney’s CEO has endorsed Rubio’s I-Squared bill. “First of all, if a company gets caught doing that, they should never be able to use the program again. If you get caught abusing this program, you should never be able to use it again. Rubio’s new legislation, however, triples H-1Bs without adding any reforms to protect American workers, said Hira. Each foreign professional can stay up to six years, so Rubio’s annual inflow of 195,000 H-1Bs would allow Americans companies to hire roughly 1.2 million foreign professionals in place of American professionals — doctors, accountants, therapists, designers, pharmacists, professors, managers, lawyers, reporters, architects, software programmers and engineers. The number could rise above 1.2 million, because H-1Bs that are given to non-profits, such as universities, are not counted against the annual limit. Hira explained that Rubio has known for months about the H-1B outsourcing in Florida. However, while Democratic Senator Sen. Bill Nelson (D-FL) spoke out publicly against Disney, Rubio was silent. While Bill Nelson has called for an investigation into the H-1B program, Rubio has only worked to implement his legislation that would triple the problem. Rubio’s own legislative record frequently contradicts his rhetoric. For instance, during the Gang of Eight bill, Rubio repeatedly declared that, under his bill, illegal immigrants would be ineligible for welfare– even though, in reality, citizenship would entitle them to every single welfare benefit. Rubio frequently spoke about the need for a visa-tracking system, even though he voted against including one in his immigration bill. Rubio said his bill would allow no amnesty until the border is secure, even though Chuck Schumer revealed that the bill would grant amnesty “on day one”– a fact Rubio later admitted in a Spanish language interview, although continued to claim the opposite in English-language interviews. Rubio said his bill would reform the immigration system such that immigration was “merit-based,” even though, according to analysis from Sen. Jeff Sessions (R-AL), Rubio’s bill would have unleashed a flood of family-based chain migration. Similarly, after his 2013 immigration expansion plan was rejected by the American people, Rubio pledged that his new immigration priority was securing the border. However, for a year and a half, Rubio refused to support a single immigration enforcement bill offered by his colleagues. Instead, prior to this month, the only immigration bill he had backed was the I-Squared immigration expansion. GOPig errand boy Rubio, a liar? Say it isn't so Joe! Meelertime beaches/mud in your eye. Rubio is a RINO tool to fool the people. They know their numero uno Jebito is OUT, so Rubio is the backup Plan B. Don't be fooled people. Ted Cruz is the only conservative running that will truly make a change and drain the swamp.